Siam Makro Plc, operator of the Makro cash-and-carry store chain in Thailand, is moving a step further to explore retail opportunities in the Asean region. Chief executive Suchada Ithijarukul said the company shipped grocery products under its own Aro brand to Myanmar last week to test the market response there. It wants to evaluate feedback before exporting a big bulk of products to the neighbouring country. 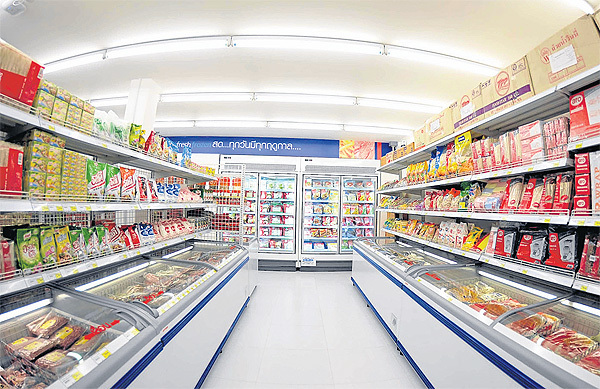 Siam Food Co, a subsidiary of Siam Makro, has been selling frozen food to Vietnam for years and knows the demand of local customers. It supplies many hotel chains there. “The feedback from Vietnamese customers was very good. We think we understand the tastes and preferences of Vietnamese people quite well,” Mrs Suchada said. Mrs Suchada said Siam Makro is seeking opportunities in other Asean countries including Cambodia and Laos as the region will integrate as a single market under the Asean Economic Community (AEC) by the end of 2015. However, expansion in some Asean countries will take time for Siam Makro as retail laws and regulations are different from those in Thailand and land prices are expensive, so the investment cost to build a cash-and-carry store is high. Mrs Suchada said the announcement of martial law yesterday had not had any negative impact on the business of Makro, which sells foods and necessary goods. “Siam Makro continues to grow whether the country’s economy is good or bad. Our business plan will continue as planned and it’s too early to speculate on the impact of martial law on the cash-and-carry business,” she said. After the implementation of the AEC, Mrs Suchada believes Thailand will continue as the hub for Asean in many business sectors. The number of tourist arrivals to Thailand will sharply increase and this will benefit hotels and restaurants, which are important customers for Makro. The hotel and restaurant business will continue to grow by at least 20% per year. Siam Makro will cash in on huge purchasing power from the AEC by paying more attention to customers from the hotel and restaurant sector and providing them with more food and products. It will also try to open more Makro Food Service stores in tourist destinations and adjust product assortments at regular Makro stores for hotel and restaurant customers. It has about 67 Makro branches across the country. There are only Makro Food Service outlets in Pattaya, Hua Hin, Koh Phangan and Patong beach in Phuket. The company reported a 12.5% rise in its sales to 35.4 billion baht in the first quarter of this year, with a net profit of 1.27 billion baht. It expects this year’s total sales will grow by more than the country’s GDP growth. Last year, sales stood at 130 billion baht with a net profit of 4.29 billion baht.Shares of MAKRO yesterday closed on the Stock Exchange of Thailand at 33.50 baht, up 50 satang, in trade worth 7.88 million baht.